Late last year, I received a package from a friend back home. I adore getting packages and letters in the mail, but I was even more ecstatic when I saw what was inside. 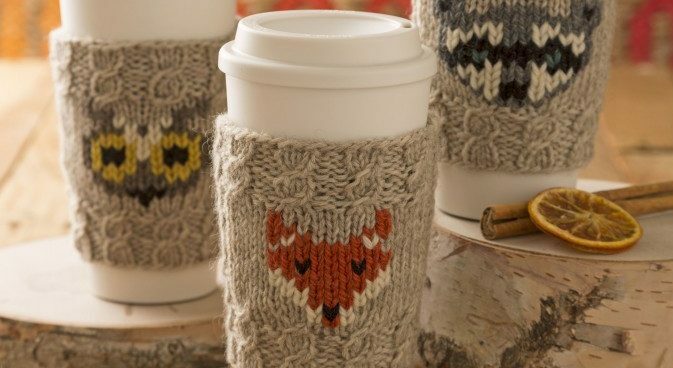 She had knitted a coffee cozy with a fox on it and sent it to me. I know how much time projects can take, and it meant a lot to me that she went through the time and effort to make something I could use as well as love. While I don’t drink coffee, I do drink a lot of herbal tea, hot cocoa, and cider, so I popped the cozy over my favorite cup and have been using it ever since. It’s practical, beautiful, and a reminder that there are people out there who think of me and love me. It’s a lot to pack into a little gift, but very meaningful. If you have friends or family members far away who love hot beverages, this little memento will bring a smile to their face every time they use it. 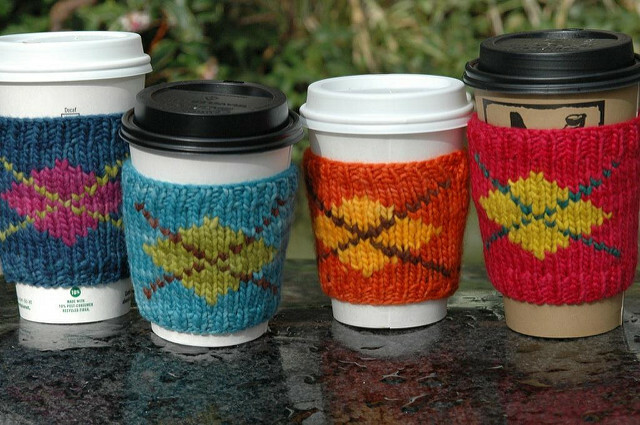 Of course, there are hundreds of options for coffee cozies these days, so where does one start? Depending on how well you know your recipient’s likes and dislikes, it could be a pretty simple process. I’ve found a few crowd pleasers that I think will be easy enough for most knitters to make in an afternoon. First, the Forest Friend Cozy from Stitch And Unwind. This is tagged as an “Intermediate” pattern because of the graph design and color switching. You’ll need double pointed needles, worsted wool yarn, and some patience for this project. There are options for a fox, a raccoon, and an owl. This is a great stash-buster pattern because of the little bits of yarn used for the animals, as well as the 50 grams of yarn used for the cozy itself. Next, the aptly named “Junkies Java Jerkin” from Marjorie Walter. If you know someone who loves argyle, they will go gaga for this cozy. It comes in two sizes (S/M and M/L), and is also a great stash-buster because of the bits of yarn it uses to create the argyle pattern. You’ll need to know how to read a graph, as well as how to shape and use a mattress stitch to sew up the seam. 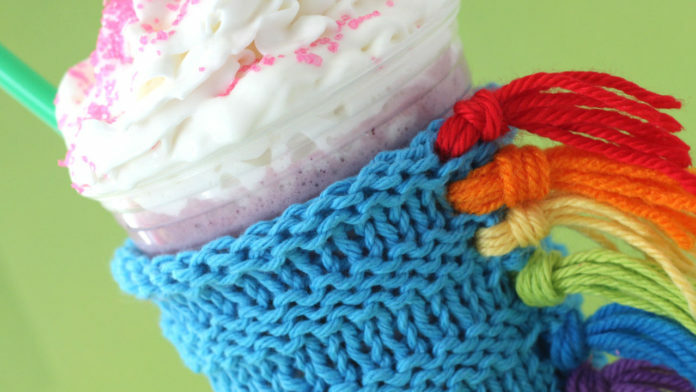 If you’re looking for something a little more wild and unique, look no further than the Unicorn Cozy from Studio Knit. This can be personalized with a person’s favorite colors and is easier than the first two patterns. You can use worsted or aran weight yarn, and you’ll be using regular knitting needles, along with a yarn needle and scissors. 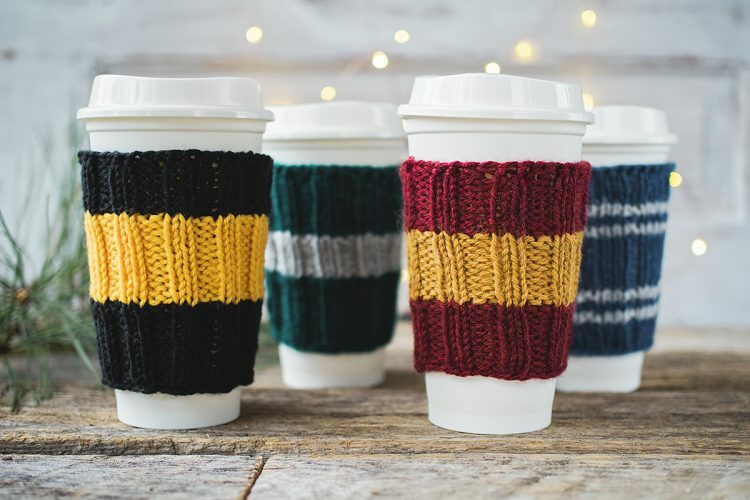 Of course, if you or your recipient are Harry Potter fans, then you can’t do better than the Hogwarts-scarf inspired cozy pattern from Patty Mac Knits. 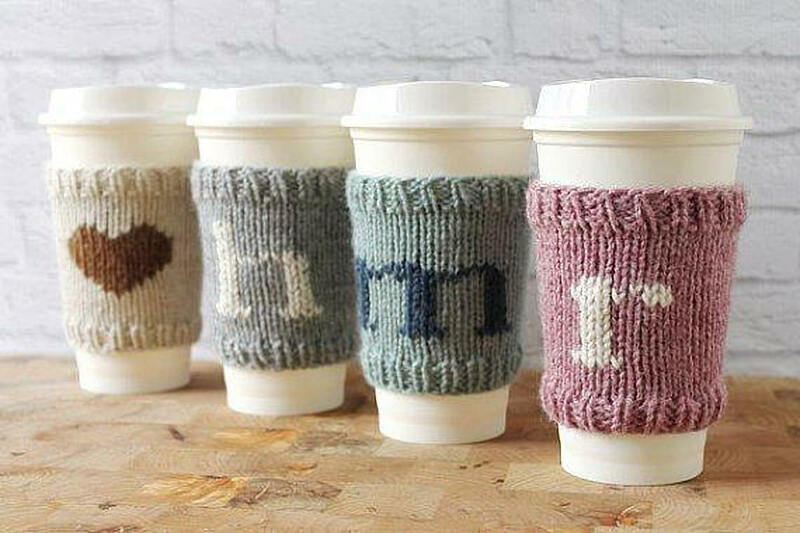 Three of the cozies have the same pattern. Only the Ravenclaw pattern is different and I believe it’s because Patty is using the movies as references. This is the easiest pattern and works up very quickly with little yarn. 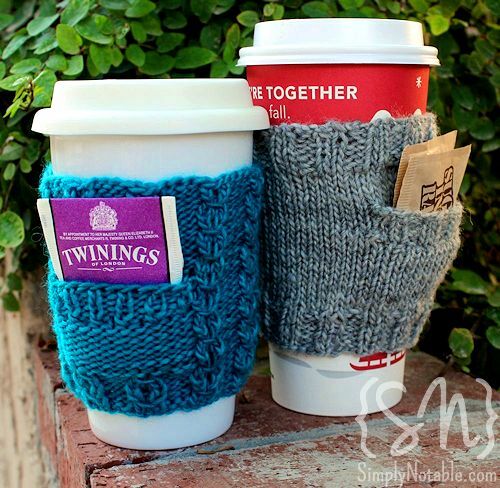 Lastly, if you’re a bit more traditional or practical, the coffee cup cozy with an extra pocket for a packet of your favorite hot drink might be your cup of tea. Simply Notable’s pattern is an instant classic, and should please the book-loving, tea-drinking acquaintance who is receiving this gift. If you want to grab any of the free patterns, you can find them on Stitch And Unwind, Marjorie Walter’s Ravelry page, Studio Knits, Patty Mac Knits, and Simply Notable.